The black tide swept over the horizon like an endless sea of gigantic ants. The pale starlight glinted on thousands of iron helms and spears as the serried ranks of Orcs chanted their warsongs, and the mountains were filled with the sounds of their drums as the earth shook beneath their iron-shod feet. The horde ran tirelessly, barely feeling the weight of the dark mail which hung from their shoulders, and their eyes glowed with an unquenchable desire to loot, to pillage, and to kill in the name of the Dark Lord, their master. I might try to tell you that orcs are graceful, courageous and noble creatures, pure of mind and body, who, sadly, have been greatly misunderstood, and misrepresented for decades. However, if I did tell you that, I would be lying. Orcs are cowardly, clumsy, ignoble, and pure neither in mind nor body. However, some of them are fast, others are strong, and they are both numerous…and generous! Yes, generous! Any Orc will always sacrifice his time, effort and blood to help out any Dark Lord wanting to bring ruin upon the lands of men. As such, they tend to make up the bulk of most armies fighting for such leaders. This being the case, it is rather fortunate that there is such a vast number of manufacturers who have chosen to purvey what are most certainly an integral part of every fantasy collection. Happily, in almost every fantasy milieu, orcs vary greatly in both size and physical form; so many of the problems with mixing manufacturers, which may be found with other races, simply do not apply with orcs! The order in which they appear below is based purely upon my personal whim, and is not indicative of the quality of the miniatures produced, though the ones most suitable for building a full army are near the top. Formerly known as Icon, and before that as Harlequin, Black Tree are very much a wargamers manufacturer, with most of their figures being designed for the battlefield rather than the display cabinet. Black Tree's main weakness is that each they force the buyer to purchase two variants of each non-command figure. They produce no less than four completely different orc ranges, the differences between which are so great that I feel compelled to look at each individually. Possibly their finest range (and in my opinion the finest range of orcs ever made, and certainly the best of their kind), is their LoTR line. Feel free to interpret those initials as you see fit, which contains both orcs with white hands on their armour, and orcs sporting red eyes on their shields. 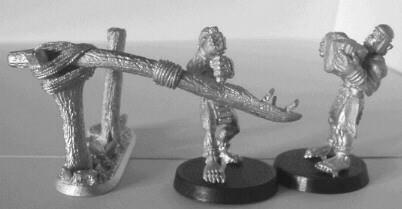 Although for copyright reasons (which were allegedly 'explained' to Black Tree by employees of our local Evil Empire), these officially have nothing to do with a certain well-known trilogy of books by J.R.R.Tolkien, it must be said that the "Orcs of the Wizards Tower' make fine Uruk-Hai, while the 'Forces of Darkness' orcs could easily fill in as Black Uruks of Mordor. Beautifully detailed, complete with eye or hand insignia on various parts of their armour, the photographs below come nowhere near to doing them justice. In addition, they rank up wonderfully, and all for just £1:00 apiece, dropping down to 75p during Black Tree's regular sales. 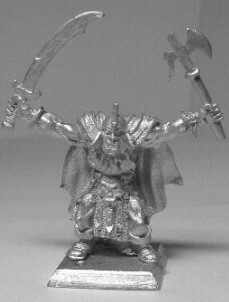 As well as the LoTR line, which is virtually unique in style, Black Tree also produce a 'Fantasy Armies' range of orcs. 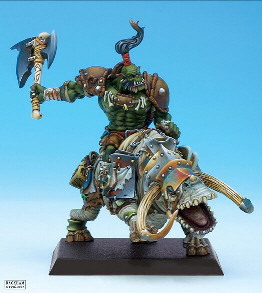 These chaps, each sporting a suitably gormless smile, lack detail and have vastly oversized heads, which makes then completely unsuitable for non-gamers, but, since they are composed entirely of mail and orcflesh, they are ridiculously easy to paint. Oh, and they will merge in seamlessly with any Evil Empire orcs sculpted between 1991 and 1995. The quintessential rank and file, these are available with crossbows, swords or boars, and also have assorted war machines attached to the range (chariots, stone throwers and bolt throwers). 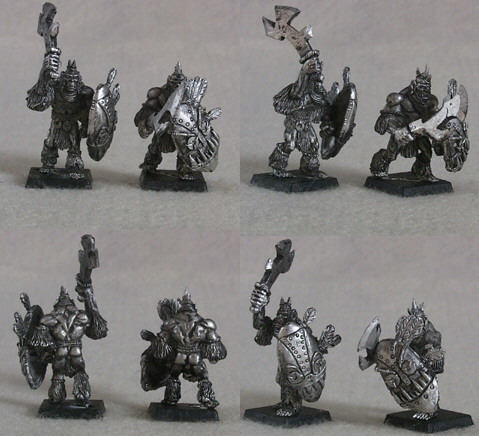 In addition to the traditional mail-armoured grunts, there is also a matching set of unarmoured 'barbarian orcs'. These are all supplemented by some (not very good) 'dark orcs' and a small range of (utterly appalling) 'Gallic orcs'. 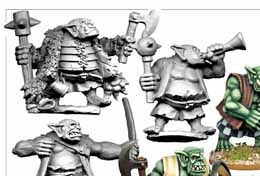 A more upmarket take on the 'happy orc' idea is available in the form of Black Tree's gigantic (both in number of variants and the size of the figures) 'Great Orc' range, formerly known as the 'Barnosk Orcs'. Sculpted by Kev Adams, these are utterly wonderful models, as long as you have a well-developed sense of humour! Well detailed, with a massive amount of variation within the range, some of the larger individuals are just as tall as most ogres. Slightly more expensive than most Black Tree infantry, but worth every penny. 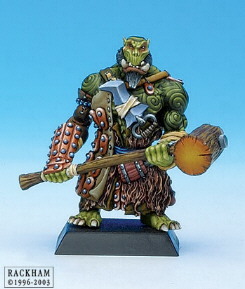 Finally, we have Black Tree's latest set of green-skinned hooligans, their strangely named 'Kustoss Orcs'. The archers seem just about ok, but the sword-wielders are rubbish. These aren't really in the same league as the majority of Black-Tree's orcs. West Wind have only recently begun to produce orcs, but they've already got enough to create a full army. 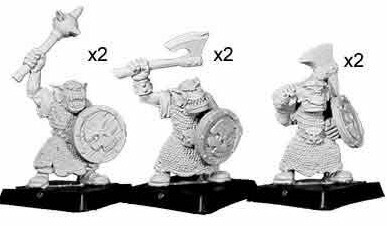 Good value at £1:00 apiece, these are available with swords, two-handed axes, bows, or spears, and there are also three different character sets and a mounted pack. All the rank and file are multi-part and cast in pewter. Unfortunately, the rank and file infantry are only available in boxes of twenty-four, and the characters in boxes of eight. They have faced a fairly mixed reception, and have been accused of being rather crudely sculpted. In addition, they allegedly don't rank-up particularly well. The armour is a little bit too chunky for my taste. A pair of full reviews, which discuss the amount of variety in each box, are available here. "The orcs are, well, pretty. Heavy armor, sharp edges, pointy things, and big grinning faces with lots of teeth. 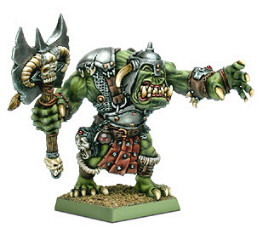 They're large relative to the standard GW orc size - coming in just about exactly the size of Grimgor Ironhide. This puts them into the Rackham scale of Orciness - which is fine I suppose - but they make my Dragonrune orcs look like really angry runts. That's probably the biggest drawback. Stylistically, these guys are very much the large well muscled orc family rather than the more human body shapes of other lines. "I can't recommended these figures highly enough. They are all big solid figs in good poses. The fact you can mix and match the heads and arms is a real bonus, meaning even repeats can look substantially different once based up - and at 1 pound/figure you can't go wrong. That's hardly more per figure than GW plastics, and these are all metal. 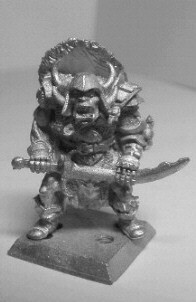 (On that note, not sure but think heads/arms may be compatible with GW plastics for a bit of mixing if you so desired). The casting is a little rough, but nothing that won't clean up perfectly and is more flash than imperfections in the mould lines. Sculpting maybe lacks a little of the finesse of other lines, but is perfectly adequate with tons of detail. Go out and buy them. Another fairly new company, Vendel aim to "provide the wargamer with believable figures that bridge the historical/fantasy gap", with Tolkien being an obvious influence. 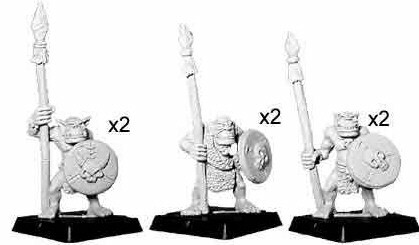 So far they've only managed to produce shield-equipped orcs, although these come with a variety of weapons and poses, and are available in large and small varieties! (Click on the picture to see them all!) The figures are reasonably priced at £1:00 apiece, and, unusually, the command figures cost no more than the rank-and-file. 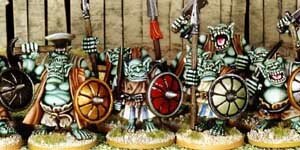 Assuming that they do not differ from the Vendel goblins in this respect, there are no duplicates in any of the six packs, each of which contains eight miniatures. The figures themselves have been accused of being stiffly posed and 'too human', and the heads are somewhat large, but the faces are characterful and the detail, although minimal, is well-sculpted. Definitely worth a look. This German manufacturer only sells its orcs in boxed sets, with a few exceptions in the DSA lines. 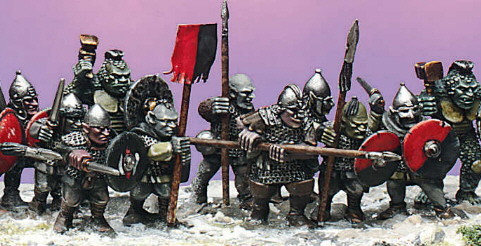 I rather like the general style (both in physique and armour) of orcs which they have gone for, and there's a wide variety of different troop-types available. However, the detail looks to be a bit shallow (and thus not ideal for painting), and each sculpt occurs twice in each box. They might mix in quite well with EE figures from the late eighties, or possibly with Black Tree. 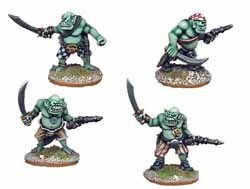 The Old Glory orc range, which is to be found in their 'Ghost Miniatures' fantasy subsection, is rather old, and it shows. The sculpting isn't great, the poses are stiff and awkward, they don't have slottabases, and there do seem to be duplicates and near-duplicates within packs. However, they are awesomely cheap, with a large number of variants and weapon-types. 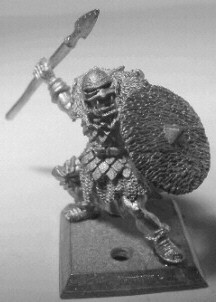 Ral-Partha's 'fantasy armies' orcs are beautiful things, with good orcy faces and physiques, fairly realistic armour which appears to have been mainly looted off corpses, rather than made to order, and dynamic poses. However, this last does mean that they don't rank up terribly well, and they do have a tendency to be absolutely covered in flash. Many of the bases have hole-slots rather than strip-slots, which don't always fit particularly well, and the detail is not always as crisp as might be desired, making them a little bit tricky to paint, but none of these problems are unsurmountable. Possibly better for roleplayers than for wargamers. 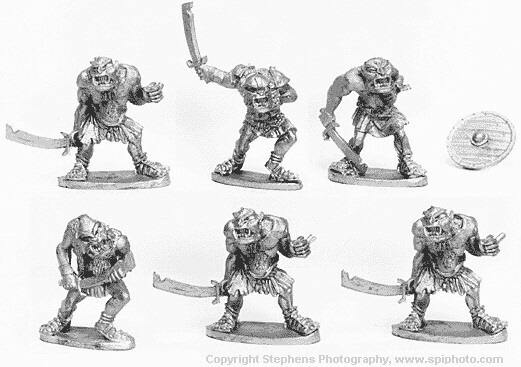 But these are not the only Ral Partha orcs. 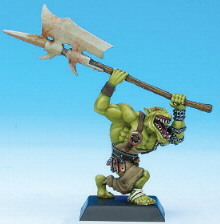 The pictures above are of orcs from their 'crucible' line, which are still pretty good, and still pretty expensive. Unlike the great majority of manufacturers, whose orcs tend to be clad in dark-age clothing and armour, following the precedent set by Tolkien, Foundry have moved more towards the high medieval and renaissance periods for their inspiration. As such, their orcs either have massive amounts of armour, or none at all. Two different ranges are available. The 'War Orcs' and the 'Mercenary Ogres', the latter being dressed up in all the latest renaissance fashions, ruffs and all. 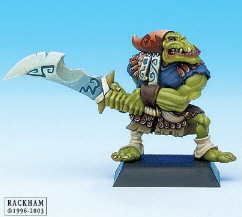 At £2:00 each, the war-orcs are rather expensive, and they are only available (ridiculously) in packs of thirty. 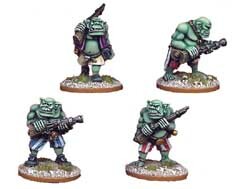 However, the Mercenary Ogres dwarf even these price wise, and the addition of orclings (effectively Foundry snotlings) and the dreaded 'ramage' (utterly useless gubbins) which you are forced to buy with them means that only the most financially well-endowed of gamers will want to buy any. As miniatures, they are cleanly sculpted, with good characterful faces, although strictly in the 'happy orc' vein, but the 'War Orcs' aren't as detailed as some, in addition to being massively overweight to an orc, and none of them look to rank up particularly well. Not Kev Adam's best work. 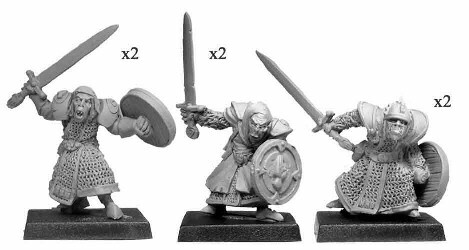 As one might expect, since Crusader's orcs were sculpted by an ex-foundry man, this small range, comprising only eight figures so far, is also renaissance-influenced, being made up of 'orc pirates'. A bit thinner than Foundry's lads though. 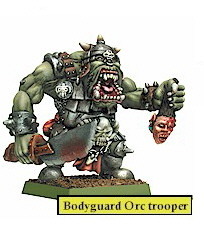 Very much in the modern EE 'Grimgor' mould, these are covered in bulging, sinewy muscle, fairly bitty armour, and fangs nearly as large as the horns on their helmets, especially in the case of the 'bodyguard orcs'. The 'fearsome orcs' are slightly more subdued, and rank up rather well, in contrast to their larger cousins. They are all nicely sculpted and covered in detail. Unfortunately, there are only twenty-one different variants including command (so only fourteen rank-and-file variants), and all of these are infantry equipped with melee weapons. I'm probably a bit unusual in not being a big fan of this French manufacturer. A lot of their miniatures look much less impressive without having been painted by the awe-inspiringly good Rackham painting staff. 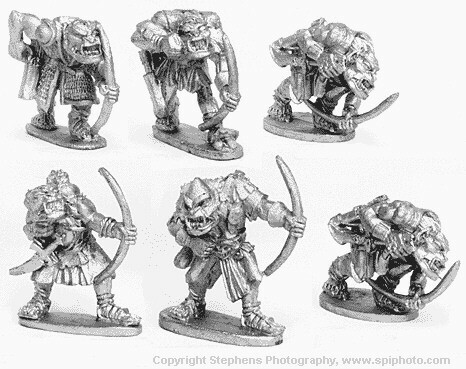 All the same, they are all extremely well sculpted, with tons of detail, but the poses (which aren't all ideal for ranking up) and prices (which are even greater than those charged by the EE) mean that Rackham's orcs are more suited to collectors and painters than gamers. The orc range has a huge variety of different styles, with some being beautiful works of art, and others being utter dross. 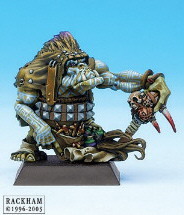 As with all Rackham ranges, it's still worth a look if you're in need of unit-leaders or standard bearers. Click here to continue this Showcase: page 1 - page 2 - page 3 - page 4 - next page.